Metter's Dixie Guards Camp # 1942 in conjunction with members of the Ogeechee Rifles Camp of Statesboro and The John C. Carter Camp of Waynesboro hosted a living history presentation featuring Union and Confederate reenactors depicting the lifestyle of soldiers in the War Between the States. The presentation focused on the living conditions and weapons used in the War. 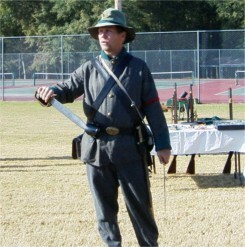 The presentation also included a brief history of the flags of the confederacy and the weapons of the typical soldier. Artifacts of soldier life, camp life and accouterments were displayed. The students were also shown a weapons and artillery loading and firing. Students listened, asked questions and examined the artifacts. Photos below are from the presentation. Photos courtesy of Judy Cockman of Statesboro who assisted in the presentation. Above: (L) Steve Burke showing a Confederate Bowie Knife and (R) pointing to the Union flag of the war period. 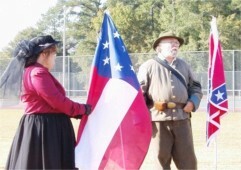 Above: Sarah and James Willis of the Statesboro Camp discuss the "Stars and Bars" and other flags of the Confederacy. Stars and Bars (L), Battle Flag (R). 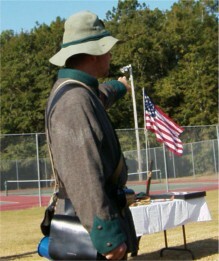 Above: Hu Daughtry of the Metter Camp portrayed a Union Soldier. 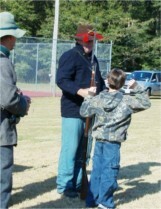 Above: Jay Clifton of the Metter Camp shows a student the weight of a Confederate musket. Above: Students and teachers listen attentively and ask questions during the presentation. Compliments to Jay Clifton, Steve Burke, Hu Daughtry, Jim Willis, Sarah Willis, and Judy Cockman for organising the presentation and to the Candler County Intermediate Schools, Candler County Board of Education and Candler County Recreation Center for supporting the presentation.